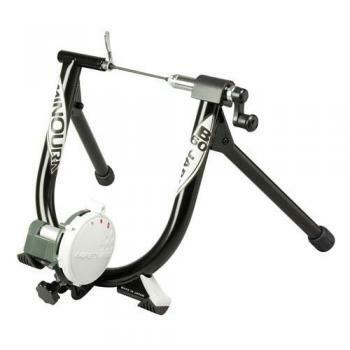 The Minoura B60-D is Minoura’s entry-level turbo trainer that uses their Magturbo braking system. This magnetic brake is famed as being the original magnetic resistance unit on the market, and is something that has been adopted by most tops brands now (magnetic resistance rather than the exact same design). The B60-D has 3 different resistance levels that are manually set on the braking unit itself, therefore you cannot vary this during your workout and would need to get off your bike to modify (see the B60-R for a handlebar lever). The power generated at 40km/h on this trainer is 425 Watts, and if you can get up to 60 km/h you will generate 662 Watts, which is verging on the low side. 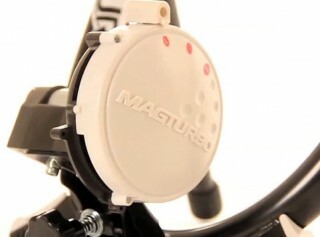 The Minoura B60-D magnetic turbo trainer uses a 0.6 kg dual steel flywheel and a standard ferrite magnet to create its inertial and resistance forces. 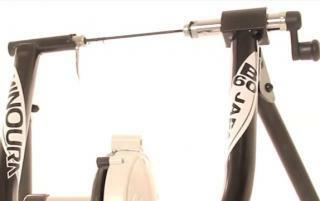 The frame itself is relatively basic but solid and lightweight, weighing around 5.5 kg. The trainer comes with a special Q/R skewer to replace your bikes normal skewer that allows it to fix on the frame easily and securely. You get a manufacturer’s warranty of 1 year for the braking unit and 5 years for the frame.